This was the first book I finished in 2012 (the other books I’ve been posting about over the last few days were all reads from the end of 2011) and what a great book it was to start a new year with! 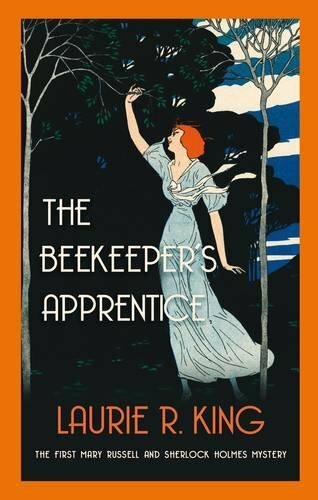 The Beekeeper’s Apprentice begins when fifteen-year-old Mary Russell, living with an aunt in England following the deaths of both her parents in America, is out walking one day and almost steps on a man who is sitting on a hill watching bees. This man happens to be the famous detective Sherlock Holmes, who has retired to the Sussex countryside. In Mary, Holmes finds a mind as intelligent and observant as his own, and the two soon become friends, with Holmes teaching Mary everything he knows about detection. Soon Mary finds herself working with the detective on what will be the first of many cases they’ll solve together and even after Mary leaves home to study theology at Oxford University, their friendship remains as strong as ever. A lot of time in the first half of this book is spent introducing us to the characters and relating a few of Mary and Holmes’ earliest cases (one involving a woman whose husband is suffering from a mysterious illness and another involving an American senator’s kidnapped daughter). These two cases, and the third main one, appear to be unrelated at first but they do all add to the bigger picture. There was a section in the middle of the book where Mary and Holmes go to Palestine which didn’t seem to have much relevance to the plot, though I’ve since learned that we find out more about that in a later book in the series. There were so many things to enjoy about this book: great characters, some intriguing mysteries to solve, a setting that I loved (the early 20th century, during and following World War I). I also liked the way the book began with Laurie R. King telling us that she had nothing to do with the book and had simply received a mysterious box of manuscripts written by Mary Russell herself. The Beekeeper’s Apprentice is therefore presented as if it was the first instalment of Mary’s memoirs, with her older self looking back on her younger days and the beginning of her relationship with Sherlock Holmes. Most of all, I loved Mary Russell’s witty and engaging narrative voice. Her friendship with Holmes feels so natural and there’s some great dialogue between the two of them. The huge age difference (39 years, I think) is slightly disturbing when you think about it, considering Mary is only fifteen at the beginning, but it didn’t come across that way at all in the novel. Despite the differences in their ages and backgrounds, Mary and Holmes have a lot in common and Mary is Holmes’ equal when it comes to spotting clues and making deductions. I loved the portrayal of Sherlock Holmes too; he felt much more human and likeable than the Holmes I remember. And as they spend more time together, both characters change with Mary maturing into a confident young woman and Holmes eventually coming to accept her as his partner. You might be wondering if it’s necessary to have read Arthur Conan Doyle’s Sherlock Holmes books first, but no, I don’t think it’s necessary at all (there are some references to people and events from the original books, but nothing that would prevent you from understanding this book). I have read Conan Doyle’s books, but it was a long time ago and I wasn’t really a huge fan, which I think might have actually made it easier for me to accept this depiction of Holmes and the other characters. I can’t believe it’s taken me so long to discover these books (The Beekeeper’s Apprentice was published in 1994). The one advantage of coming to the series so late is that there are now another ten books to read without having to wait for each one to be published. I can’t wait to spend more time with Mary Russell and Sherlock Holmes and hopefully I’ll have many happy hours of reading ahead! These sound like good books and ones I will look out for. I have only just read one of the short stories featuring Holmes, I love the deductions that he makes. I’ve read a lot of them (though not all) but it was so long ago I can’t remember much about them now. I need to put them on my list of future re-reads! I love the sound of this book and will definitely look out for it. I hope you enjoy it, Joanne! I was instantly captivated by this book as well – at the time, I think there were four books published, and I read through all of them – and then came the wait for the next one. I’m a big fan of her modern series, set in San Francisco – and of her stand-alone book, Folly, which I think is hands-down her best. I’m glad to hear her other books are good too, Lisa. I want to read some more of her Mary Russell books first, but I’ll look out for Folly! This book is just magical, isn’t it? Your review makes me want to read it again right now. I’m glad you liked it too! This sounds lovely, the perfect read for a cold Sunday afternoon. I also really like the cover. It’s a great cover, isn’t it? And yes, it was a perfect read for this time of year! Maybe you have changed my mind–I’ll have to think about it. I have read Laurie L. King’s detective books with pleasure but have not picked up the Holmes books. As an author myself, I generally don’t approve of writers appropriating other authors’ characters. I would never read Scarlett, and though I loved the Laura Ingalls Wilder books, I hated the idea of a television series that diverged from her work. And the one episode I saw did not capture the essence of Laura and Mary. Conversely, I don’t mind the 007 movies though Ian Fleming is obviously not writing them.. (I’m nothing if not inconsistent.) But I know Agatha Christie hated what happened to Ian Fleming so much that she killed Hercule Poirot. I can understand why you wouldn’t approve of it from an author’s perspective, Deb. I didn’t mind Laurie R. King using the character of Sherlock Holmes, but maybe if I had been a fan of the original Holmes books I would have felt differently. I haven’t read any of the Jane Austen sequels or retellings though, and not sure I’ll ever want to! Yep, but I’m a hypocrite. I actually like remakes. I loved the movies Clueless (Emma), Bridget Jones’ Diary (Pride and Prejudice) and the novel Here on Earth (Wuthering Heights). Hooray! It always makes me happy to find another Mary Russell convert. This reminds me that I really need to carry on with the series. I’ve only read the first two, so there are plenty of happy hours of reading ahead for me as well. I hope we both continue to enjoy the series, Ana! I very much enjoyed TBA and watched the progressing relationship with interest and sympathy. One thing has always bothered me, though. At the end, in the confrontation with Morierity’s mad daughter, did Holmes shoot Russell accidentally when disposing of her. I think those several sentences are confusing. Have read them over several times and still don’t quite follow it. I’ve only read the book once and that was in January, so I think I’d have to read it again to be able to help you with that. I’m glad you enjoyed it though!